In an increasingly disposable world, it is no wonder people crave a classic, high-quality item that can withstand the test of time. This is why celebrities, athletes, and others who desire a distinctive timepiece turn to Oris watches. Since 1904, this Switzerland company has been making distinctively-designed mechanical watches that are sensibly-priced. Look for Oris’s trademark red rotor to know that what is on the inside is the brand’s long-lasting, high-quality mechanics. This symbol lets you know that a watch was built on generations-old techniques that will be around for many generations to come. We are pleased to carry Oris collections in a number of designs to suit personal styles across the spectrum. Those who embrace designs that do not go out of style will appreciate watches in the Culture collections, like the Rectangular and Classic. The Classic perfects simplicity with its round case and three-hand date. The Rectangular features a less common strong geometric shape while maintaining and elegant appearance. Lovers of time-tested designs also love our selection of Oris’s Aviation watches like the Big Crown and the Big Crown Propilot. The Big Crown made its entrance in 1938 and is still a favorite. The Big Crown Propilot ups the ante with cockpit-ready features tailored to the needs of pilots. While all of the Oris watches we carry feature solid mechanics and classic styling, the Diving and Motor Sport lines incorporate special modern features. The Diving collections, including the Divers and Aquis lines, are designed with high performance in mind. Both feature modern engineering and water resistance but the Divers collections come with a vintage feel while the Aquis lines offer a more modern aesthetic. The Motor Sport collections incorporate performance features along with sporty styling suited active lifestyles. 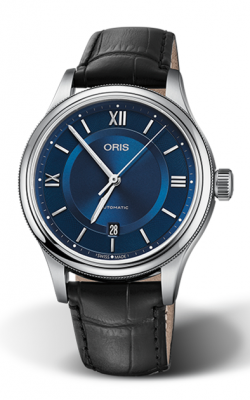 Why Shop for Oris Watches at Long Jewelers? Long Jewelers is proud to be an authorized retailer of Swiss timepieces. Under the guidance of award-winning jewelry designer David Long, for over 30 years we have served Virginia Beach as a purveyor of fine jewelry like wedding bands, engagement rings, and classic watches. We have the largest jewelry showroom in Virginia, attracting loyal customers from Norfolk and throughout the Greater Hampton Roads Area, as well as the Tidewater area and earning us the title “Best of the Beach” more than 20 times. To learn more about our products, sales, services, or on-site jewelry repair, visit Longjewelers.net or call us at (757)498-1186.